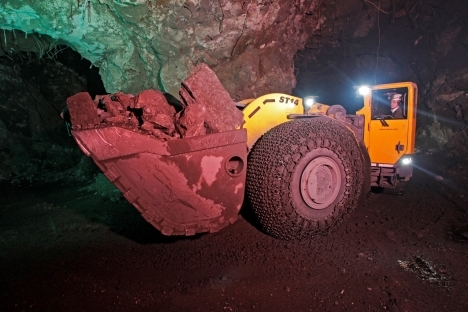 Every day, 900 miners extract 10,000 tons of ore from the Taymyrsky mine, which extends 1,300 metres below ground. If Norilsk isn’t on Mars, then it must be nearby. Norilsk is one of the largest cities beyond the Arctic Circle. Like Mars in the John Carpenter film Ghosts of Mars, it was developed for mining – back in the 40's, the Soviet Union needed nickel and other metals for use in its defence industry. In preparation for a trip down the mine, I get up at 7am when it is still pitch black outside, and drink two cups of strong tea. I then climb into whatever warm clothes I have brought with me – it’s -28C outside. Norilsk is known primarily for nickel; however, the first miners came here for a different, more commonly used metal. Back in the Bronze Age, people discovered copper in these mountains and started smelting it. The smelting process has changed dramatically since then, of course, but the raw material remained unchanged. Ore from Norilsk pits goes through several processing steps before turning into shiny plates of saleable copper. First, ore is granulated, dried and prepared for the Vanyukov furnaces, some of the world’s biggest. Copper is smelted at between 1,200C and 1,600C; the metal resembles volcanic lava at these temperatures. Fire-refining is the next stage, followed by casting liquid copper into moulds. The cooled copper plates are brought to the cell room, where they are placed in tubs with a blue-green electrolyte fluid. After a few days of “bathing” in a sulphuric acid solution, copper plates are ready for the customer. The mud that remains after electrolysis is not wasted, for it contains platinum, silver and other rare (and very expensive) metals. On approaching the Taymyrsky mine’s administrative building, I see the first Martian artefact: shrouded in the pre-dawn darkness is the menacing bulk of a machine with wheels three feet high and a huge scoop attached to the end of its iron, brontasaurus-like nose. It looks heavy and threatening. I ask Rostislav, a Norilsk Nickel employee who is accompanying me, what kind of military-grade equipment this is. “It’s the underground loader made by Atlas Copco, a loading and delivery machine with a capacity of 14 tons,” he replies. I learn later on that Norilsk miners regularly hold underground slalom races driving those machines, and regret that I didn’t have a chance to see it with my own eyes: a rodeo on 25-ton, 400 hp dinosaurs must be spectacular. After a meeting with the mine’s director, Sergei Gorbachev, I prepare to enter the mine by putting on a full miner’s outfit, with a head torch and a 2 lb accumulator over my shoulder. The accumulators have built-in microchips that count each miner as they enter the mine. With the miners, I march along in single file through a long underground corridor linking the administrative and recreation building with the mine itself, and enter the anteroom of an elevator shaft. A cage behind the lattice doors will take us almost one mile below ground. While waiting, Rostislav points to a row of sinks lining the wall and says: “Go ahead, try it.” I turn the tap and a reddish-brown liquid starts dripping. The mine water looks unappealing, to put it mildly. “Try it,” Rostislav repeats. It turns out this is not rusty water after all – it’s actually tea. The miners fill their flasks with it. I touch in my accumulator – it’s my ID for today’s trip – and enter the cage. The lift has an enormous platform which transports both the miners and their mining equipment down the shaft. It makes its first stop at the 1,050-metre (3,445 ft) mark. The mine is a web of tunnels, mining galleries, crosscuts and other underground passages with German names such as Querschlag (which means cross-cut) or Strecke (which means drift). They cover hundreds of miles, with electric trains, mine buses and loaders running through the wider tunnels. The one we have stopped at is slightly below the ore body. There’s one more above it, which is mainly for ventilation, and one below. The tunnels are about four metres (13 ft) wide and four metres high; they look like subway tunnels or underground nuclear missile control bunkers. Ours is quite well lit by powerful lamps that diligently disperse the darkness. Breathing is surprisingly easy at this level. Several minutes later, after a bumpy ride down, we come to a stop. “We are now inside the ore body,” Aleksei explains. At this level, there are no lamps on the walls, our torches struggle to shed light through the darkness and the unusual smell is stifling. Miners have two main kinds of tools: drilling machinery and explosives. Special machines are used to drill narrow wells 50ft deep, in which the explosives are placed. The resulting cavities are deepened further. The ore itself is mined using the “room and pillar method” in which miners use explosives to cut out “rooms” from tunnel walls with an area of five by five metres (16 ft) and up to 20 metres (65 ft) high. Then it’s the turn of the “brontosaurus” – the loading and delivery machine. “Sergei, show the guys how you do your job,” Aleksei tells one of his colleagues. Sergei exits the cabin and stands a couple of metres away from the machine. Then, with well-trained precision, he presses two buttons on the remote control and all the lights on the machine turn on, cutting through the mine’s pitch-black darkness. At the same time, the engine roars into life, and the 14-ton scoop is ready to eat into the rock. The first bite is enough to chop off 10 tons of ore, but the miners want more. The machine growls and comes back for seconds. Loading and delivery machines serve for four or five years on average. After that, they are written off and taken apart for spare parts. Some of the Norilsk miners have been working here for 20 or 30 years, spending shift after shift underground. The mine operates 24 hours a day; there are three seven-hour shifts per day – with around 300 workers on each one. Up to 10,000 tons of rich ore is extracted with the machines every day. The ore is collected, prepared, crushed and lifted to the surface using a skip hoist. It is then sent to a concentrator, and then to nickel or copper smelters, depending on which metal prevails in the concentrate. “There’s almost no manual labour these days, unlike in the past,” says Gorbachev. The work is still dangerous, though. Norilsk Nickel miners are mostly afraid of tunnel collapses. To reduce the risk, offloading wells are drilled that take on excess pressure and reduce the risk of collapse in cavity areas where people are working. After ore is removed, the cavities are filled with concrete. The fewer cavities there are underground, the safer it is for the miners. I start my ascent back to the surface from the 1,300 metre level below. My ears pop in the elevator on the way up, as do the miners’ ears. They ask me what it’s like to be a journalist and what sort of salaries are paid in Moscow. The miners smile discreetly upon hearing how much a reporter makes in the capital; as far as I could make out from the managers, the miners earn considerably more than I do. The elevator cage would take the miners back down the 1,300 metre mine again the next day. But I boarded a flight back to Moscow with a copper ball smelted from the ore extracted at the mine in my pocket as a souvenir. I still don’t know how it got past airport security. It must have been my good luck.